Most industries which involve manual handling would benefit from using a truck or trolley to help reduce the health risks involved with lifting and carrying heavy loads – read on to find out more about different types of trucks and trolleys and why they are potentially useful to you in your job role. Large deliveries usually arrive on pallets that are loaded onto the back of a lorry. Using a pallet truck allows you to move the whole delivery into the warehouse in just a few trips, efficiently and safely. The design of the pallet truck is very simple but extremely clever at the same time. There are two prongs at the front that slide under the pallet which is then raised by the operator until the pallet is lifted off the ground. The weight is taken by the strong prongs and not by the operator. Pallet trucks are capable of lifting and moving up to 2,500kg. Sack trucks are an easy and convenient way to transport goods; they come in various shapes and sizes, folding options for easy storage stair climbers etc. Because they are predominantly plastic, these trolleys are easy to move, lightweight and are low maintenance. This means that you can move what you need to move without needing to worry about it for very long. If you are working in an environment where storage is an issue these types of trolleys are designed to nest together to reduce the amount of space required to store them. 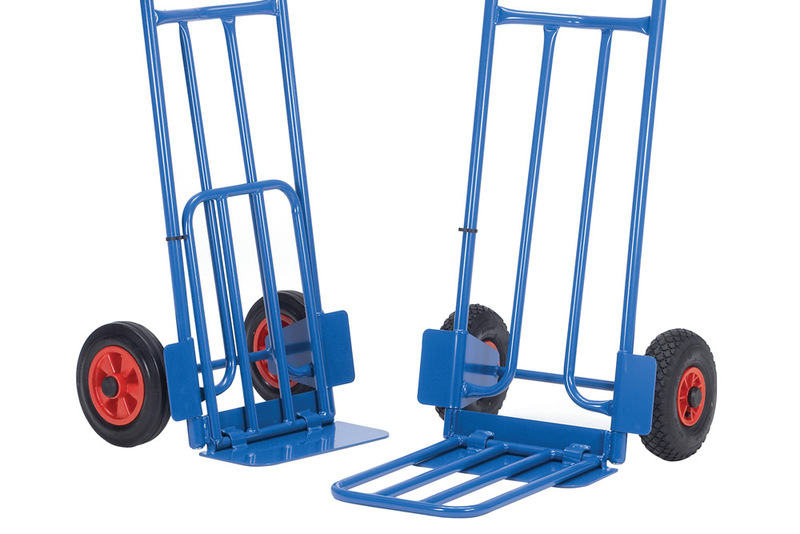 In our range we offer a light duty version, load capacity is 320kg with a folding basket, ideal for retail or distribution centres – click here to view. We also supply a heavy duty version that can move up to 500kg – popular with cash and carry outlets. If you need to move items that are long or wide such as sheets of wood or metal then we have a range of trolleys just for you. Wide load trolleys – A versatile truck that can be adjusted to transport wide or narrow objects safely. Balanced board trolley – Designed to safely transport large boards and panels. Multipurpose board trolley – Steel trolley with sections for transporting a variety of products such as dry boards and tubes or timber in a vertical position. High and Long Frame trolley – Heavy duty trolley designed to safely transport large sheets of steel, wood and other materials. Carpet/pipe trolley – Strong steel frame designed for moving heavy, cylindrical goods, especially carpets. Garden centre trolley – Heavy duty truck for use in garden centres and suitable for industrial tasks. To view out full range of trolleys click here. At Key, we sell a range of different trolleys for very different uses across industrial and office sectors. We recommend that you have a look at our offering and see for yourself how we can help you. Don’t forget to keep checking back on this site for more helpful advice. If you have a very specific question or need, please don’t hesitate to get in touch with the team at sales@key.co.uk or call us on 0800 652 6000, they would be more than happy to help.